Recently I was so lucky to host a lunch at GOODNESS -the brainchild of Elettra Wiedemann who is not only beautiful and graceful but extremely intelligent and hard working. She put an incredible program together at Ed’s Chowder House during Fashion Week with the help of my wonderful friend, Barry Parasram. Caravan Stylist Studio hosted a lunch with Yeohlee, Walter Baker, Agnes Baker and others to celebrate the opening of the studio. 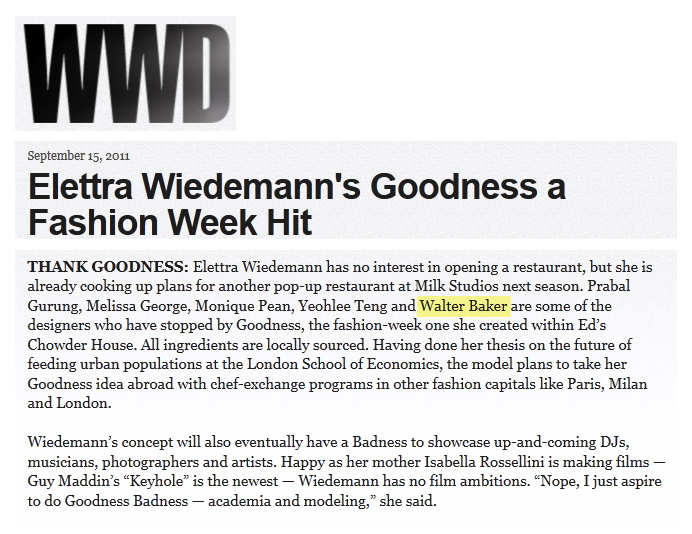 WWD came to check it out – WWD wakes me up every morning and I enjoy having tea and reading it! So it is an honor to have our events and people we respect in it – it is so exciting to read all about everything. More about GOODNESS – Elettra Wiedemann launched GOODNESS as a pop up full service restaurant across the street from Lincoln Center at Ed Chowder’s House. Throughout a four day period Goodness served breakfast and lunch and provided a HEALTHY menu. They featured a different chef every day and on the day we went September 13th – SEERSUCKER from Brooklyn was the partner which was so AWESOME since I know Kerry Diamond and her family and I think this restaurant is so yummy and so great. I was very lucky! Btw .. Elettra has major credentials besides having elegant taste and a genius idea she studied at the London School of Economics on the future of feeding urban populations. She also won the Young Environmentalist Award 2011 for her dedication to promote global solar power. Her charity is “One Frickin Day” (OFD) and in the past three years, she has been able to raise enough money to install enough solar panels in Burundi Haiti and Rwanda to provide solar energy for the next 25 years. I really like how she thinks. I believe it is all about sustainability and thinking about what we do upon ourselves when we eat, work, exercise etc and what we do onto others and how we can help others. It is the cycle of sustainability where we can all help ourselves and help each other.